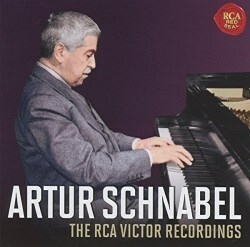 Schnabel’s 1942 Beethoven RCA Victor sides were re-issued on BMG RCA Red Seal 74321 987172. This new twofer reprises that release but adds a previously unreleased set of Schubert’s Impromptus, D899, which will be of very considerable interest to Schnabel collectors. The sonatas were rejected for publication by the pianist and only surfaced on LP in 1976. They and the two concerto recordings have always been less often reissued than his more famous pre-war sets. That they have generally been less well appreciated is, I think, also true. But they are handily compiled here and make strong claims on the Schnabel admirer, even one who has that earlier complete sonata cycle or the Sargent-led Concerto recordings. In Op.109 we can hear again the remarkable sense of space and span in his playing and, for all that he was chided as professorial, the naturally unforced eloquence of the last movement. As with Op.111 – where the first movement is more measured and the passagework tends to be more considered – these remakes are less volatile and full of momentum than the earlier discs. The Arietta theme of Op.111 is a case in point but throughout both these sonata performances one feels slightly less of a sense of pressing Schnabelian-Beethovenian rhetoric than his earlier self. Though I should add that they still occupy an important place in the discography, still profoundly indicative of Schnabel’s eminence in the repertoire. The Concertos, in a sense, share the same trajectory as the sonatas. Stock was a fine, much-underrated conductor (as a Biddulph release graphically illustrates) and no time beater, as he was often caricatured. Nevertheless some of the transitional moments in the Fourth sound a mite forced and some of the orchestral sonorities are a bit 'fat' (in the first movement) or not clearly defined (in the finale). Schnabel sustains musical concentration throughout and is energised and strong boned in the finale (and hear him keep the pedal down at the end). I like the Emperor even more – from the pompous horns, all puffed up and preening, through the rapt direction of the slow movement (even when you feel it could be quicker you realise the rightness of Schnabel’s tempo in absolute terms) and then to the finale – full of caprice and fun. There’s brief damage around two minutes into the opening Impromptu – one wonders whether that is inherent in the original and may have necessitated holding back the release. Otherwise, these performances are in general a touch freer and brighter than the familiar post-war set. The left-hand pointing in the E flat major is dapper, deft and delightful (more so than in the remake) and the range of his tone is better experienced here, especially in the G flat major, than in 1950. Arguably his rubato is a touch subtler here too. Taking a little more time in the A flat major gives his right-hand descent a more rounded and affectionate, less stressed quality. The BMG transfers were sloppy. In the concertos surface noise comes and goes – it’s always better to have a uniform level of 78 crackle than to have it intrude and recede – and there are pre-echoes in the sonatas (badly in the opening movement of Op.111) and scrunches on fortes. I could add that the sonatas sound as if they need a treble boost as well. The engineering was anonymous, possibly rightly. These latest transfers are a considerable improvement eliminating the problems that bedeviled the earlier release. The addition of the Schubert set is no mere archival pedantry. It adds something valuable to Schnabel’s discography, to which Jed Distler rightly alludes in his pithy notes. This valuable release is made much the more so by the inclusion of the Impromptus.